Anthony "Rumble" Johnson silenced 30,000 in attendance in Stockholm's Tele2 Arena as he slayed Alexander Gustafsson to angle his sights at champion Jon Jones. Part of a memorable night in the Swedish capital, Gegard Mousasi controversially finished Dan Henderson while it was another home-nation fall for Akira Corassani earlier in the night. It was fever-pitch for the main event, but those emotions would soon plunge to jaw-drop as Johnson possessed the relentless power to break past the iron chin of Gustafsson. The Swede set out to control the fight by keeping the distance, but early on Sicilia managed to get inside with incisive striking. After jostling against the cage, Akira proceeded to wear out his opponent in the centre of the octagon and keeping it within the realms of his own playing field. For the few minutes to follow, both circled but when Sicilia landed some real leather on the home-nation fighter, the silence of those few minutes was translated onto the stunned crowd in the Tele2 Arena. Circling to the outside, he lured Corassani onto leaving the left of his guard open, allowing a huge right hand to follow and sending the Featherweight to sleep in an instant. A nice bit of work, technically named the "Shotokan step" was perfectly executed on his way to the right hand and ultimately the victory. Despite the seasoned wrestling credentials of the pair, a tentative approach to the fight in the first round consisted of a frantic search for opening on the striking platform. In a round that could've went either way, Phil Davis went for two half-hearted attempts of a takedown, but it remained on the standup. Davis continued to utilise leg-kicks with the tree trunks he possesses, while Bader looked for an overhand right. Round 2 was more in the favour of Phil Davis, where a strong takedown along with a head-kick paid dividends. Although neither fighter managed to make a statement up to that point, some grappling drew a blank, but when Davis landed flush with a head-kick, he impressed. Still though, it was cagey, well-balanced, but not exactly captivating. Clean striking on Bader's part too though caused for some heavy swelling around the left eye. As the fight went the distance, it concluded in slightly more exciting fashion. Davis continued to shoot late, striking was timid but towards the end things finished well, although it seemed too little too late for TUF season 8 winner Ryan Bader. It wasn't though. After Davis shot for a takedown, he managed to get one back and slam him to the ground followed by the klaxon to end the fight. With a fight depleted of action needed to make a statement in an exciting light-heavyweight decision, neither fighter found it. As the judges struggled to determine the little action between the two, it would come down to a split decision of which Bader edged. In spite of a much-debated stoppage, Gegard Mousasi dispatched the durable Dan Henderson with a first-round stoppage. After they circled the Octagon, the American would fall to his feet as the European landed a right-hand. With the returning middleweight stumbling back up, a few more punches sent him down. As the referee stepped in, Henderson still tried to fight his way out of it, but it was all over. Mousasi exemplified brilliant sportsmanship as he appealed to the referee when Hendo appeared to have a cut. The decision remained controversial, Mousasi had picked up a huge win, ultimately. While it may have been close to 4 in the morning local time when the lights went out in Sweden, it got a whole louder. Alexander Gustafsson entered to a rapturous ovation as he was focused in his home nation to battle an equally determined Anthony Johnson. Right from the bell, "Rumble" looked to close the Octagon off and take the height advantage away from the Swede. As both pulled no punches to swing wildly, an unintentional eye poke would cause for a momentary break. But soon after, when the action resumed, the fight would be defined. A huge right hand would stun Gustafsson, and Johnson continued to barrage the punches before the home fighter fell to the ground. Continuing the punches, the referee would bring a stop to it, and the arena would fall completely silent. The only noise heard was generated from inside the octagon and the celebrations of the American. He managed to conjure up incredible, unstoppable power that beat the iron chin of the former Light Heavyweight contender. Referee Mark Goddard decided to bring an end to it all as Gustafsson couldn't defend himself no more. He was bloodied, dazed and disappointed as under all the pressure, he buckled at the hands of Anthony Johnson. 'The Mauler' was in tears as the decision was made, and a humble Johnson said he felt bad for it, showing brilliant sportsmanship. In light of the crushing win, came Rumble's statement, he wants Jones. If you ever wanted a handbook on how to make a statement in the UFC, look no further. Not only did Anthony Johnson finish Gustafsson considering all the toughness and durability of the European, but he also did it on his home soil. Seeing "Rumble" at 205 is scary. The power he possesses is unprecedented. When Gustafsson got caught, it made the stoppage inevitable. You've got to feel for Gus though, had he not took this fight he'd be next in Jon Jones' list, but after all, it's the UFC, and fighters want to prove themselves. There was an interesting contrast in refereeing on the night, too. Dan Henderson was hardly given a second to prove his toughness yet in the main event Gustafsson took far too much punishment than needed. Yes they were different referees but surely the guidelines should apply. Jones vs. Johnson will be brilliant. Just what will happen if he lands with a right-hand? Hell could break loose. Beast @Anthony_Rumble handled business. Gus @AlexTheMauler is a first class warrior. #JohnsonVsJones Can't wait. 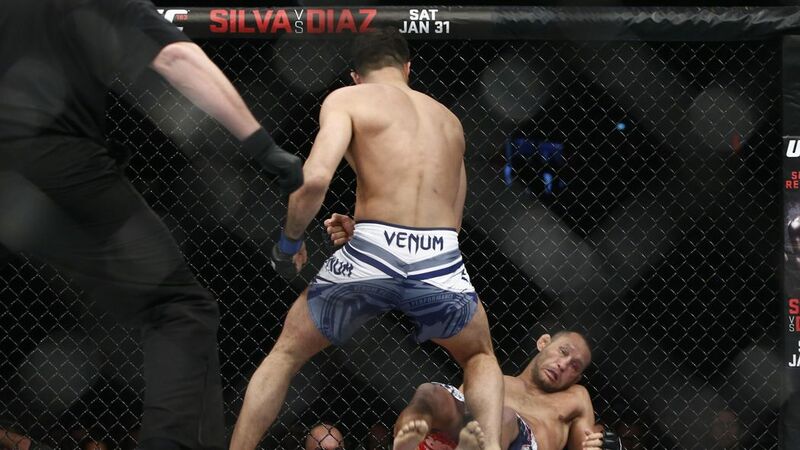 The Royal Rumble may have been a night after this, but in the UFC, there are some colossal rumbles emerging out of this. Stockholm is stunned, but Rumble is ready. Anthony Johnson silences the 30,000 in attendance in Stockholm, finishing Alexander Gustaffson in the first round of UFC on FOX 14.